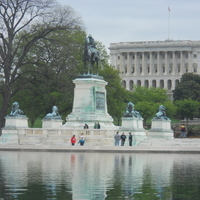 Go to the Ulysses S. Grant Memorial at the east end of the Mall, below the U.S. Capitol. You’re looking at the Memorial to Ulysses S. Grant, which was dedicated in 1922. It’s one of the most impressive pieces of public art in the US—and one of the least well known and least appreciated. It’s not like other monuments, and it sends a complicated message about war and courage and duty. Try to find these details pictured below. When you do, click on the picture for more information. 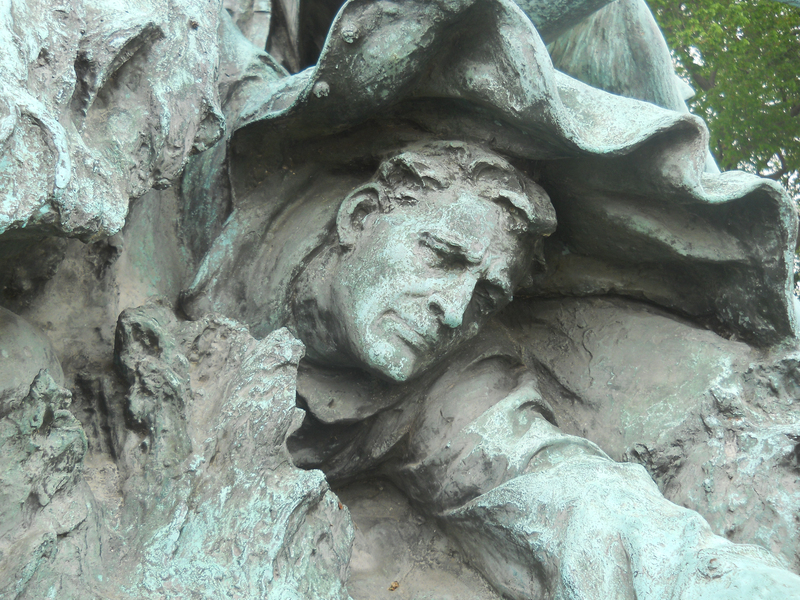 Henry Merwin Shrady designed and sculpted the Grant Memorial. He worked on it for 20 years, revising and revising obsessively. He died two weeks before it was dedicated. 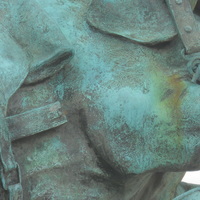 The face of this fallen rider is a self-portrait of Schrady himself. 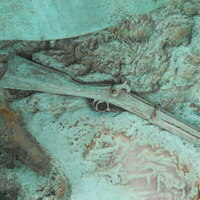 Did Shrady find himself overwhelmed by the task of memorializing Grant and the Civil War? In this group, discarded equipment lies trampled in thick, thick mud. Who left it here, and why? If you look up, you see Grant sitting on his horse far above, indifferent to the men who lost their gear and, we can only assume, their lives. If you look more closely you can find a soldier’s letter to home lying abandoned nearby. 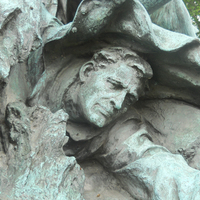 Shrady depicted the war as a chaotic, muddy grind, where a soldier might die and quickly be forgotten. This horse's bridle has snapped, plunging the team into chaos. The men in the wagon, tired and huddled against the damp cold, haven’t realized it yet. The way Shrady sculpted this group, it’s not war that wears these men down, it’s cold and mud and sorrow, and more than that it's random events beyond their control. Look back to the other group, where a cavalry charge has just gone badly wrong. Shrady depicted the war as grueling and also as chaotic and disorganized.